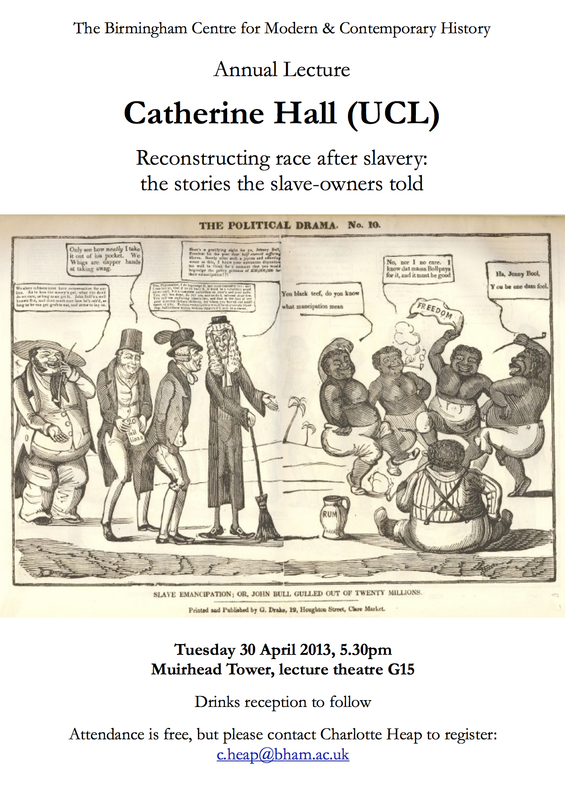 On Tuesday 30 April, the Centre holds its annual lecture, for which we’re honoured to welcome Catherine Hall of UCL, whose subject will be Reconfiguring race after slavery: the stories the slave-owners told. The lecture will draw on a major project that Prof Hall has been running on Legacies of British slave-ownership. The lecture begins at 5.30pm, and takes place in lecture theatre G15 of the Muirhead Tower (building R21 on the campus map). There will be a reception afterwards, too. This event is free but please email Charlotte Heap to register. The poster is below—and below that, details of an associated event for Birmingham postgraduates earlier in the afternoon. For postgraduates at Birmingham, Prof Hall will also be running a discussion session prior to the lecture. For details of this please contact Dr Ben White. Addendum: you can download a podcast of Prof Hall’s 2011 Creighton Lecture at the Institute of Historical Research, entitled ‘Macaulay and Son: an imperial story’, on the IHR website here.